There’s a pretty old idiom that says, “you can’t judge a book by its cover”. In the ordinary sense, it means you can’t really know everything about people simply by looking at them. However, in the literary sense, we do indeed judge a book by its cover at least enough to decide whether we want to take it off a shelf and explore its contents. I suspect the cover has a little something to do with the decision to actually buy a book too. Currently I’m at a point in my book-writing journey when Boni and John at Ingenium Books are asking me to choose a book cover. It’s a big deal and a decision not to be taken lightly. So I’m asking you to help me decide. Are you up for it? First, it seems only fair that I should give you some context because the cover of the book is meant to give you a hint about what’s inside. So here goes. 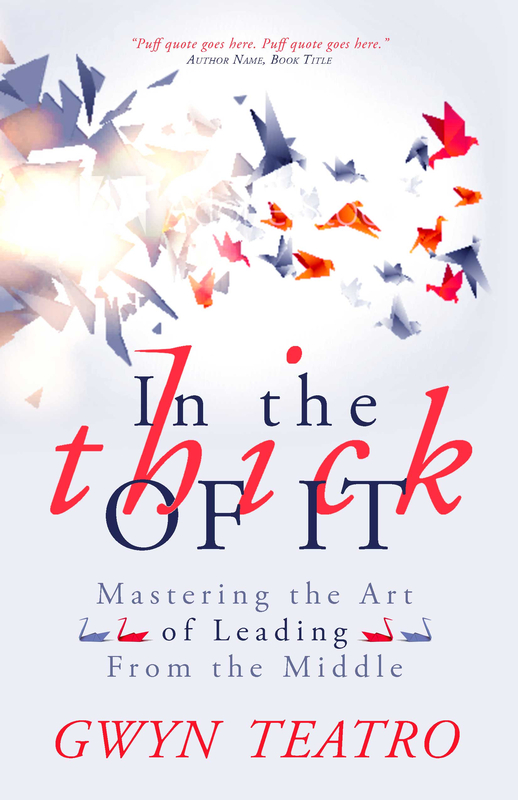 The book is entitled, IN THE THICK OF IT: Mastering the Art of Leading From the Middle. It is primarily written for mid-career professionals in middle management. This is the place where there is an abundance of people who, to get things done, must foster relationships with not only those who follow them but also with their peers and upper management too. They are not novices at this leadership thing but they may be at a place where they’re wondering if what they’ve achieved so far is all there’s going to be. It’s a kind of angst that could be described as midlife crisis but, in my experience, mid-career-ness, although not technically a word, is more accurate. After all, changes we contemplate and those we make aren’t all going to create the intensity that a crisis suggests. We hope not anyway. In general, these people work for medium to large traditional organizations where the pressure to achieve greater flexibility and keep up with customer demand for instant results, is relentless. Being in the middle of it all is a stressful undertaking to say the least. 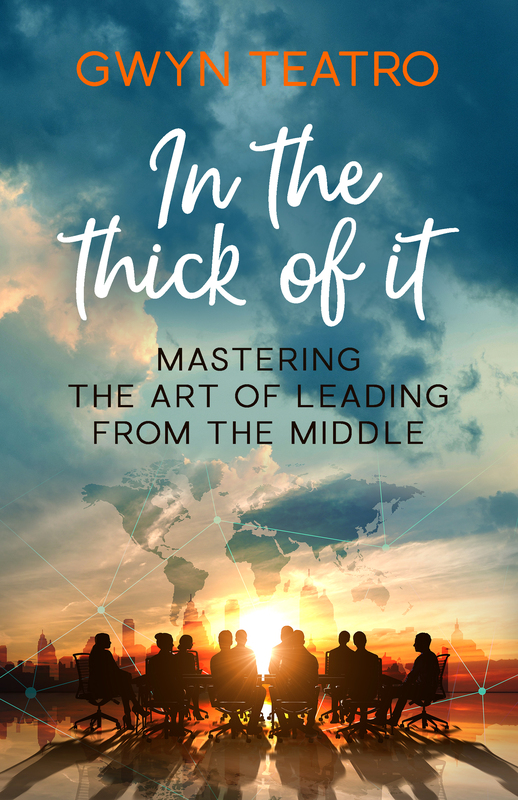 However, one of the main themes in my book is the proposition that leading from the middle can be a place of opportunity and strength as well. It will attempt to shift existing perspectives away from the notion of being “stuck” in the middle toward the idea that the middle can be a starting place for new ideas and conversations leading to positive change. Of course, while ideas are good things to float, to be of use they must be grounded in something real. 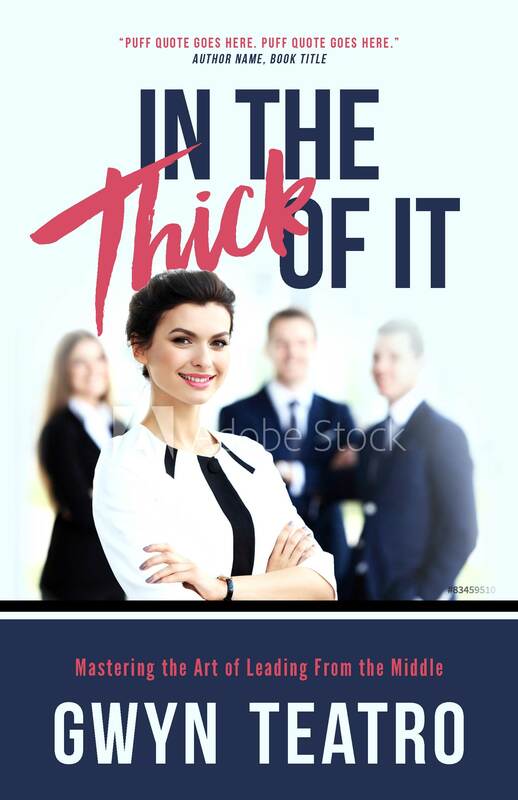 With this in mind, my book will also offer some practical strategies for becoming a better, more effective boss and colleague as well as a respected influencer to those positioned higher in the organization. So, that’s the general idea of the book. With this context in mind, I would like to ask you to look at three possible book covers. Then, in the comments below, tell me which one appeals to you most. Please also tell me why you chose this one over that one. What is it about the one you chose that would make you take the book from the shelf for further examination? Here they are, presented in any particular order. Thank you for your help. It means a lot.